In the past decade, the seemingly endless boxes and packets of dried pasta on supermarket shelves have been complemented in the cold cabinets by vacuum packed bags of the fresh variety, either in the form of sheets of lasagne, ribbons of tagliatelle or stuffed parcels of tortellini and ravioli. Unfortunately, many consumers mistakenly believe that choosing to place fresh rather than dried in their shopping trolley constitutes some form of culinary oneupmanship. This could not be further from the truth. Yes, fresh could be said to be more desirable in that it is made with eggs rather than water, and provides a different experience in terms of texture in the mouth, but it is designed for and only works with certain dishes. For example, that aforementioned softer texture may be fine with a richer meat ragu, but it lacks that certain bite, known to the Italians as al dente, that makes the dried variety a better complement to sauces with less fat content. Another misconception is that while northern Europeans are stocking up on dried pasta because its convenience dovetails with their busy daily schedules, Italians are at home making fresh pasta on a regular basis. The reality is that the vast majority of pasta consumed in Italy is dried, and for many a plate of fresh pasta is viewed as a treat for weekends or special occasions. If the recipe calls for fresh pasta, there really is no substitute for home-made. The good news is that it is a great deal easier than many people think. 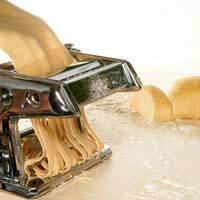 The more ambitious, or simply those who delight in filling their kitchen with impressive looking equipment they will never use, invest in a pasta making machine. The simplest and the best are hand cranked, although not surprisingly you can buy motorised models, too. If the sight of TV chefs using one of these machines to flatten and stretch the dough is a little intimidating, remember that you can make your own using just a rolling pin. And you don't have to be ornate. Just cut up the pasta into rough squares, make a ragu, or meat sauce, some béchamel, assemble in an oven-proof dish and you have yourself a lasagne. Couldn't be simpler. And once confidence is acquired, more complex constructions such as ravioli will suddenly seem not so difficult after all. Before you know it, you will be adding a little spinach to the dough to add a green hue to the finished pasta or even some squid ink to make it black. Around 120 g of unbleached flour (many supermarkets now sell the best variety, designated 00, or in Italian, doppio zero). Place the flour on a clean kitchen surface and make a well in the centre using your fingers. Break the eggs into this well and from the outside in begin folding the flour into the eggs, using your fingers to break and evenly distribute the yolk and white. Alternatively you could whisk the eggs lightly before adding to the flour. Bind the mixture together until it becomes a single mass. If the mixture continues to feel a little wet, add a touch more flour. Then knead it - pulling, stretching and pushing down with the heel of your hand - until the ball of dough is silky smooth to the touch. Wrap it in cling film and put in the fridge for 15 minutes. Clean the kitchen surface, flour it again and using a roller, also lightly floured, begin flattening out the dough until it is very thin. If the area you are working on is very tight, split the dough into two. Then simply cut out the dough into rectangular pieces and you are ready to construct your lasagne.